I’ve completed most of the photo work for my next review, but it wasn’t quite ready in time, so you’ll have to make do with a wallpaper instead. If you were paying attention during my Saber Lily review, you might notice that this image doesn’t look much like the ones from the review. That’s because I took this image back in December when I was first starting to take photos for reviews and I was still learning the ins and outs of my camera and how to light the figures. (This process never really stopped; I’m just farther down that road now than I was when this shot was taken.) Considering that I had the aperture on auto, I’m surprised it turned out as well as it did. 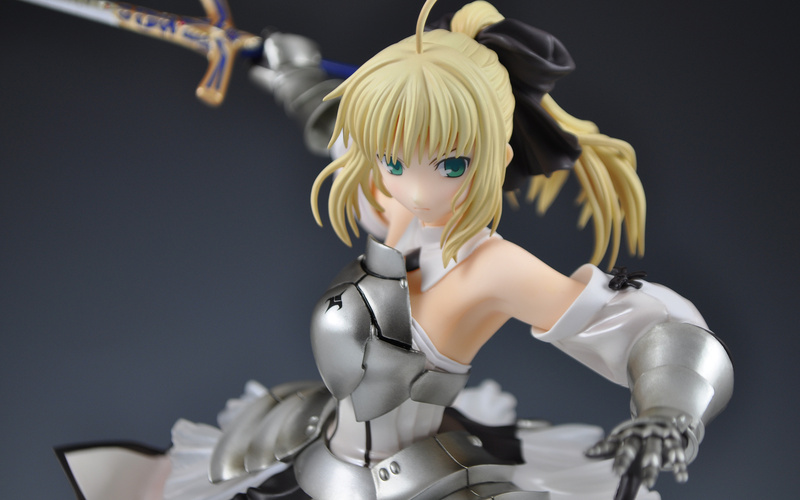 This entry was posted in Figures, Wallpapers and tagged 1/7 scale, Fate/unlimited codes, Good Smile Company, PVC, Saber, Saber Lily. Bookmark the permalink. The photo looks good to me! I still have tons to learn about my camera. I have a Magic Lantern Guide for it but haven’t had the chance to spend much time with it.